Large colourful vintage Bulova Stars and Stripes watch. 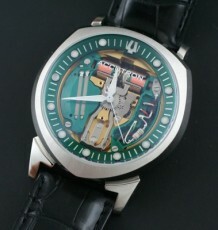 The monobloc case use a removable bezel to access the Valjoux 7736 movement inside. 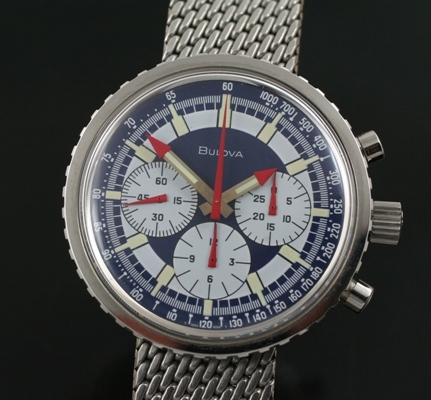 A large vintage Bulova Stars and Stripes Chronograph dating to 1970. This model does not literally have star and stripes painted all over the dials, but the bold dial colour and pattern features and interesting and exotic looking interplay of red painted hands against the blue and white background. 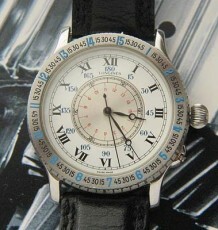 Not perhaps as subtle as the Rolex Paul Newman Daytona. The case is in spectacular condition have not been polished. 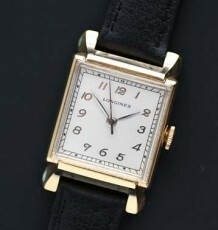 Note the original case machining on the sides of this large steel watch. The watch is powered by the 17 jewel manual wind Valjoux 3 register calibre 7736 movement which was just serviced and is functioning perfectly. 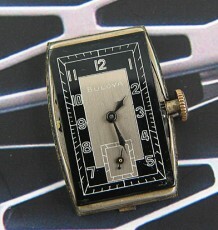 The watch also features the original Bulova signed crown and the most rare Bulova signed mesh band. The metal band will comfortably fit a 7.5 inch wrist. The steel case measures 44 mm wide and carries with it loads of wrist presence. The watch was also just serviced and is keeping great time.